AC is a small-signal frequency domain analysis mode applied to a switching circuit. 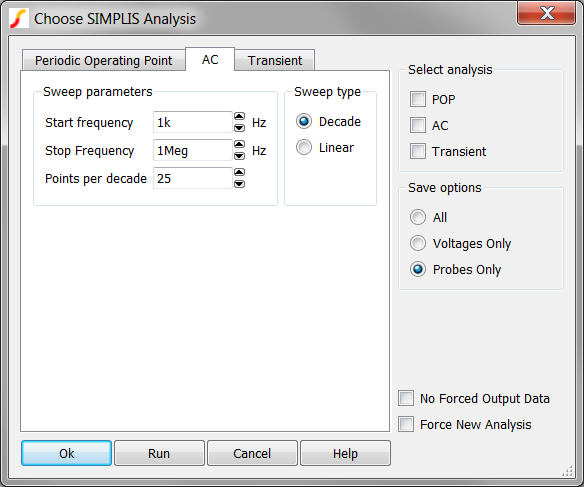 For more information about this analysis mode, see the SIMPLIS Reference Manual (Help > Online Manuals > SIMPLIS Simulator Reference Manual). Note: An AC analysis requires that a POP analysis is also defined. Click the AC tab, and then enter the values which are shown and explained below. The number of points per decade or the total number of points for the analysis. If you select Decade as the Sweep, enter in this field the number of points required for each decade. If you select Linear, enter the total number of points for this analysis.